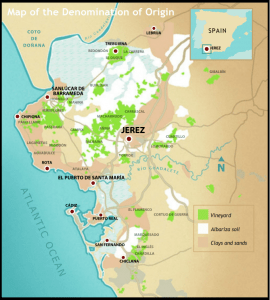 Sherry is only produced in Spain’s southern Andalucian Coastal region of Jerez. In fact, the name, “sherry,” came about from the British attempting to pronounce Jerez. Sherry is primarily made from the Palomino grape, a fairly unknown grape elsewhere around the world, but crucial to the success and style of sherry. This grape thrives in the humid climate and chalky soils of the region. The Jerez region has unique white, chalky clay soils known as albariza. Now, the palomino grape may not be as successful when produced as a still wine, but as sherry? It’s perfect. See, Sherry is a fortified wine, which means alcohol is added to the wine. Fortification can come at 2 different times – during fermentation or after. The first produces a sweet wine because the addition of alcohol stops fermentation and residual sugar is leftover; the second produces a dry wine since the sugar has been converted to alcohol. Sherry is in the latter category, where alcohol, in this case a grape-based spirit (aka brandy) is added to the wine. Aging: As a fortified wine, un-aged brandy is added after fermentation and the wine is aged in a cask system called a solera system. The solera system is a unique fractional blending process that utilizes stacked barrels, with the oldest barrels (and wine) on the bottom, the youngest on the top. Think cheerleading pyramid! Imagine: 3 barrels stacked on top of one another; the oldest wine is on the bottom and the youngest is on the top. When bottling occurs every year, the winemakers use the wine from the bottom barrel, but never fully empty it. This bottom barrel is then replenished by the barrel above it, while the top barrel is simultaneously replenishing the middle one. After both the middle and the top barrel have been topped off, the winemaker begins filling up the top barrel with the newest vintage. Since the barrels are never fully drained, they are constantly being blended with multiple vintages. The result leaves the bottom barrel with the oldest and most complex wine. 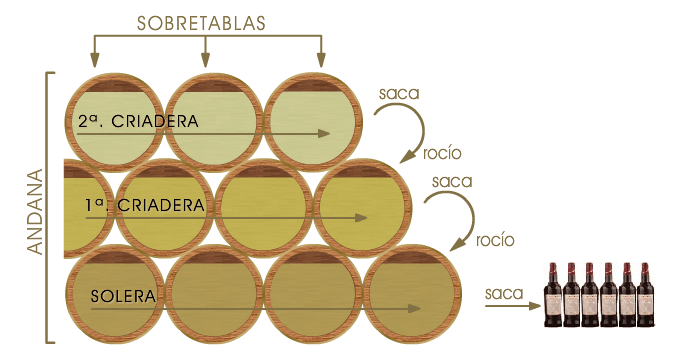 Soleras vary in how many rows they contain as well as how old the oldest wine is, and typically the older the solera, or the more barrel rows they contain, the more complex the final wine. There are generally two main ageing styles for Sherry: Flor and Non-Flor ageing. Flor: Flor (pronounced “floor”) is the thin layer of indigenous yeast cells that forms on top of sherry wines as it starts to age. It is an ivory colored, wrinkled, waxy foam that can be up to two centimeters thick. It’s not pretty. Flor protects the wine from air contact and can only grow naturally in the climate of southern Spain. Flor needs 2 things to survive: alcohol (but less than 15%!) and oxygen. If the sherry is fortified to over 15% alcohol, then the flor dies off and an oxidative aging process starts. Flor produces the “Fino” and “Manzanilla” styles of Sherry. Non-Flor Aging: Flor keeps the Sherry from being oxidized while it ages, but a lot of Sherry is also aged in the absence of flor. This allows the wine to oxidize, taking on a nuttier and richer character. The wines produced without flor are the most powerful, and typically fortified from 15% to around 17-20% alcohol. Non-flor ageing produces the “Amontillado” and “Oloroso” styles of Sherry. Fino is a delicate, light, dry style characterized by pale color with salty, green apple and almond notes. It is fortified to about 15% alcohol and aged under flor. Fino is a perfect aperitif and may be consumed either on its own or with almonds, olives, shellfish, sardines, or the local gazpacho. Unlike many fortified wines, fino Sherry tends to degrade quickly once opened—be careful serving the wine for more than a couple of days and always keep it at a cool temperature. My favorite example is Osborne Fino Sherry. Manzanilla is a class of Fino produced only in the seaside town of Sanlúcar de Barrameda. The higher humidity and cooler air from the coast encourages stronger flor growth and that makes for a fresher, lighter style, giving it additional flavors and aromas of chamomile tea. It is usually aged for 5 years in the solera system. May favorite example is Emilio Lustau Manzanilla Papirusa. Amontillado is a Fino wine where the flor hasn’t been fully developed or killed off. It is then fortified to approximately 17-18% alcohol to slow down the oxidation. It continues to age in a solera system with other Amontillado where it slowly oxidizes taking on a darker color and richer flavor of hazelnut and other savory notes. My favorite example is Alvear Amontillado Carlos VII. Oloroso is the most robust and darkest in color. It is purposefully oxidized without the presence of flor. Oloroso can tip the scales at over 20% alcohol and has intense aromas of walnut and toffee. It is the longest-lived Sherry and is matured for years in cask without the protection of flor. Powerful and dry, Oloroso (like Amontillado) is best reserved for the conclusion of a meal, paired with aged, hard cheese. My favorite example is Bodegas Dios Baco Elite Oloroso. Palo Cortado is the rarest form of sherry and is never planned. 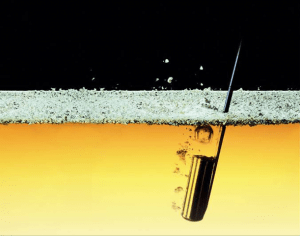 Known as a “failed Fino,” the wine starts out as a fino but the flor dies off unexpectedly and it starts to age oxidatively like an Oloroso, at which point it is fortified to protect it. The flavor profile is in between an Oloroso and an Amontillado, with some dried dark fruits, salty nuts and nougat. The traditional pairing is charcuterie, especially Iberico ham. My favorite example is Hidalgo Jerez Cortado. Cream Sherry starts typically as a dry oloroso sherry base where sweet grape juice is added to make a lighter dessert style, sweet daily sipper, or after-dinner drink with coffee. Though dairy-free, it was named at a tasting in England in the late 1800s where normal Oloroso sherry was colloquially called “Bristol’s milk” –a woman attending a tasting said after trying the new sweetened sherry, “if that is milk, then this is cream!” The name stuck and cream sherry was born. *Pale Cream sherry, which is more rare, is a sweetened Fino sherry. My favorite example is Alvear Solera Cream. Pedro Ximénez (also known as PX) is a white wine grape used to make an intensely sweet, dark dessert sherry. The grapes are dried in the sun, which concentrates the sweetness, partially fermented, fortified and aged in a solera. PX has the flavors and aromas of raisins and molasses and is the perfect pairing with decadent desserts. My favorite example is Alvear Pedro Ximinez 1927. Moscatel is made from at least 85% Moscatel de Alejandra and is treated identically to PX, except it is more floral. Often, Moscatel and PX are blending partners in dessert sherries. My favorite example is Bodegas Dios Baco Esnobista Moscatel Pasa. Now go forth and enjoy some sherry!